First a confession. 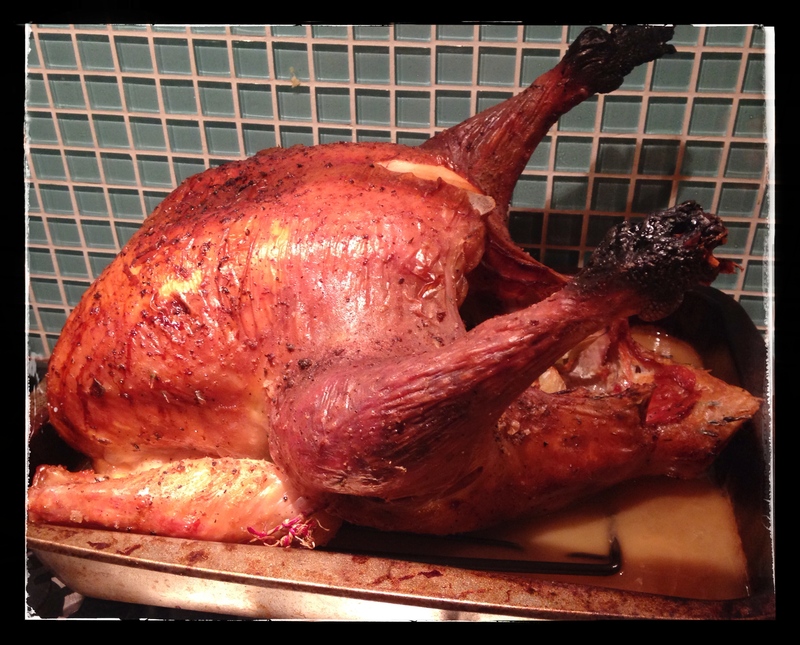 Turkey would, frankly, never be my first choice for a bird to roast, even a wonderful turkey like this one from The Ginger Pig (sorry, chaps. But I adore you all the same). I mean, there’s just so much of it, isn’t there? But at Thanksgiving — especially an expat Thanksgiving — what are you going to do? So here’s my turkey. And it was extremely tasty — it’s just that even with a crowd around the table, there was plenty left over. A word about throwing food away. Don’t. There’s no reason to. With a little planning and, honestly, not too much energy, your food waste bin/compost heap can contain only eggshells and peels and other genuine scraps; I cannot, cannot bear the thought of food left to moulder in the fridge until you have to chuck it away. Yes, that boring old line of your mother’s, about starving children, applies. If you want ideas for what to do with your leftovers, Love Food Hate Waste is a great place to start — and, hey, why not start here too with my recipe for turkey and lentil soup? If you are a British reader of this post, you might be having a turkey for Christmas, right? And now you will be prepared for all that leftover bird! I will just add, before we get down to brass tacks, that there was one element of our feast that was completely and utterly devoured — and that was my pumpkin pie, created thanks to the wizards at Cook’s Illustrated. (What? You’re not already a subscriber?) I mean — man. PP was another trad snack I really thought I didn’t have a lot of time for, and yet felt obliged to make. But this was nothing short of a revelation. Yeah, a bit of a pain in the arse to make. But totally, totally worth it. This soup, however, is easy. Go for it. You can adjust pretty much all the quantities to your taste/based on what’s still in your fridge. Think of all of this as a guide. I should say that I had fantastic, cidery, winey, turkey stock left over from Julia Moskin and Melissa Clark’s lovely, simple recipe from The New York Times; I’m sure that helped. But if you don’t have that, plain old (even, shhh! from a cube or bottle) chicken stock will do. In a nice big heavy kettle saute your onion/carrot/celery (and fennel) in the oil until soft; towards the end of the softening, add the herbs and salt and pepper. Tip in lentils and stock, let cook until lentils are soft, about half an hour or forty minutes. A gentle heat. Add the turkey and the fresh herbs — if you’ve got ’em, don’t worry if you don’t — and allow to heat through. Perfect! If you have some cream left over, you can swirl that into folks’ bowls as you serve, and I guarantee they won’t object.